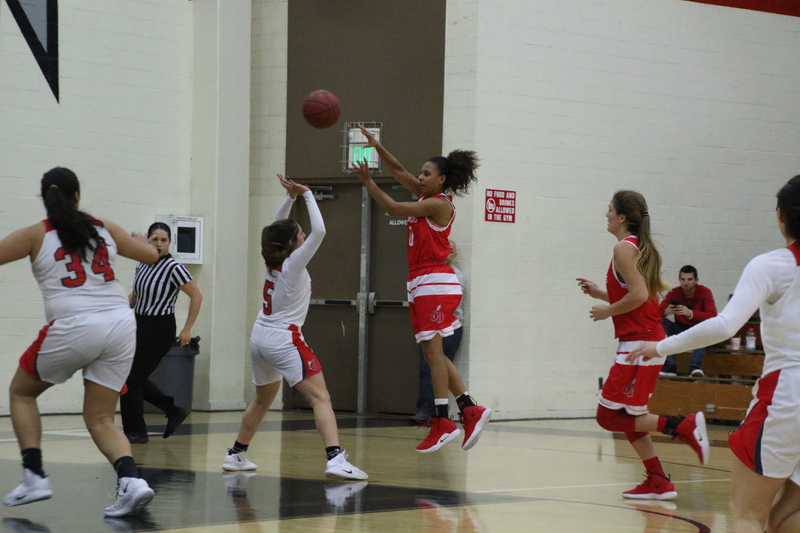 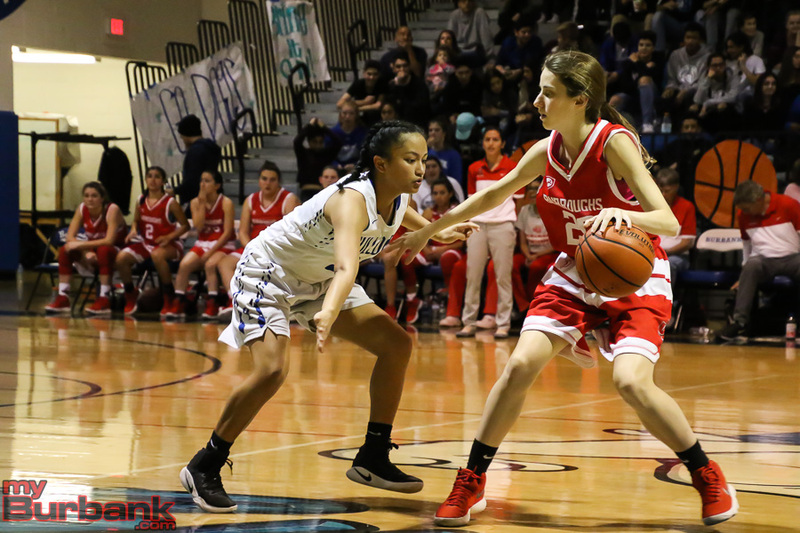 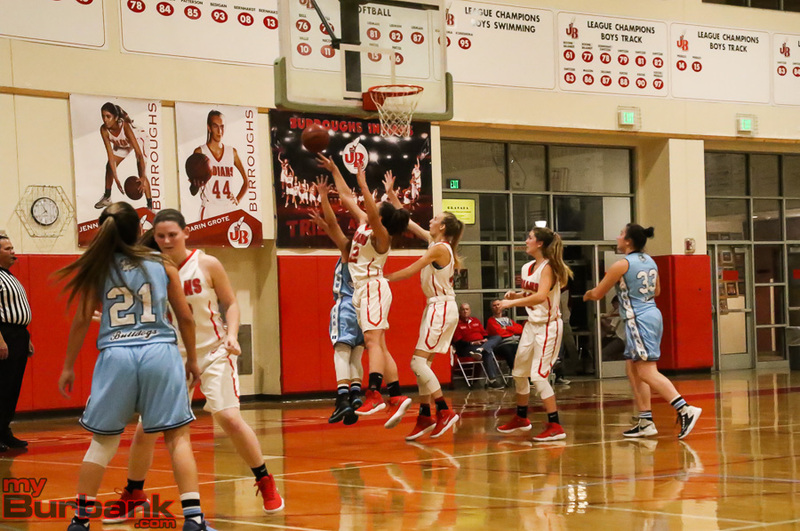 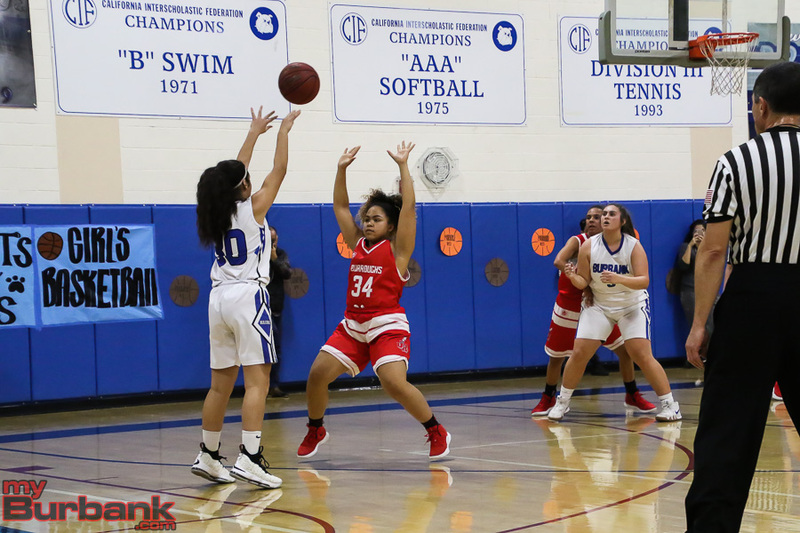 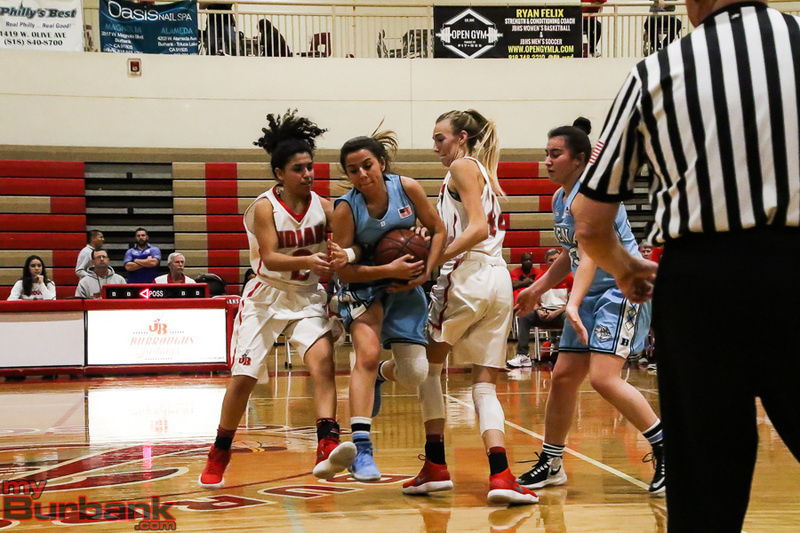 For one game, youth was served as three freshmen for the Burroughs High girls’ basketball team accounted for 36 points during Friday night’s 50-36 win over host Crescenta Valley in a Pacific League showdown. 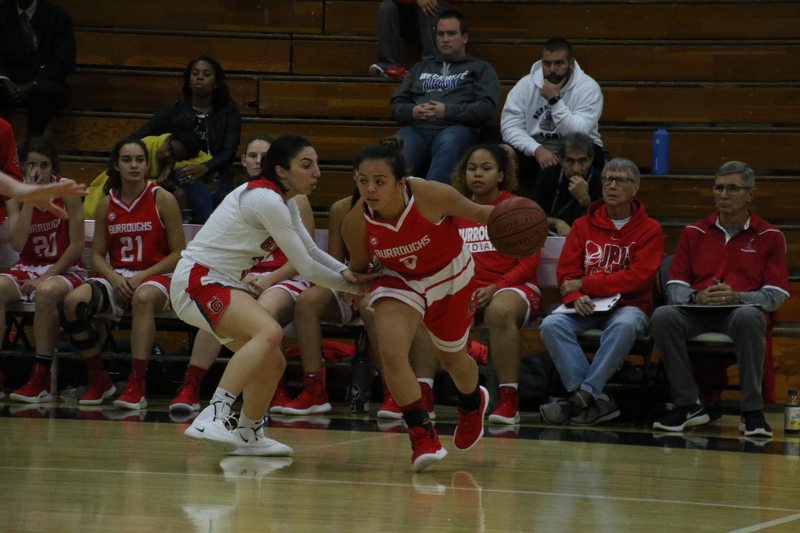 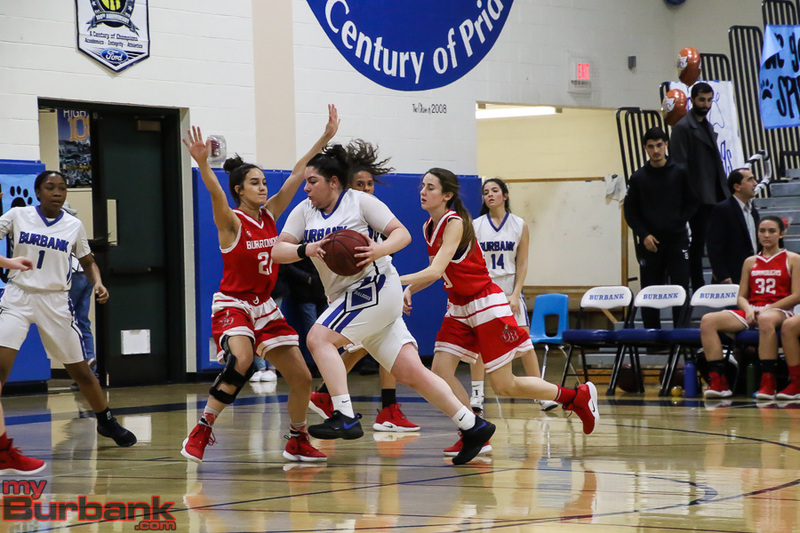 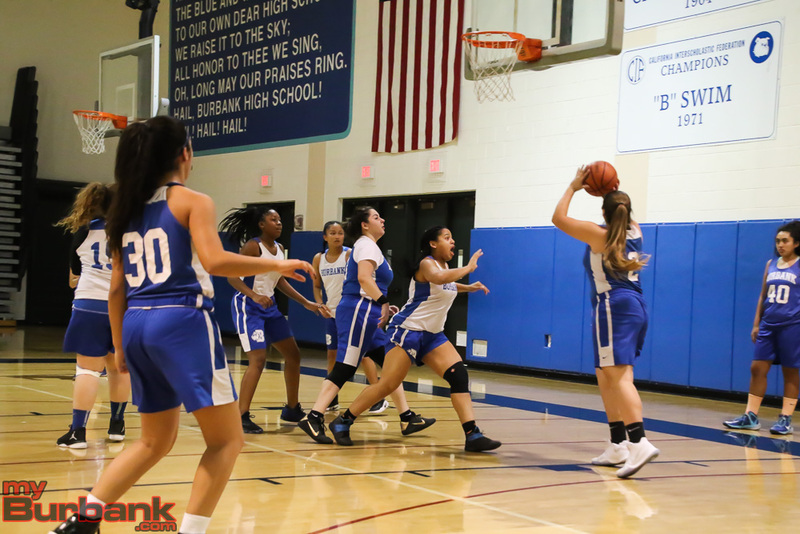 First-year power forward Faith Boulanger tossed in a game-best 22 points and pulled down a game-high 13 rebounds, power forward Kayla Wrobel added nine points with three caroms and shooting guard Dyani Del Castillo chimed in with five points, all in the first quarter. 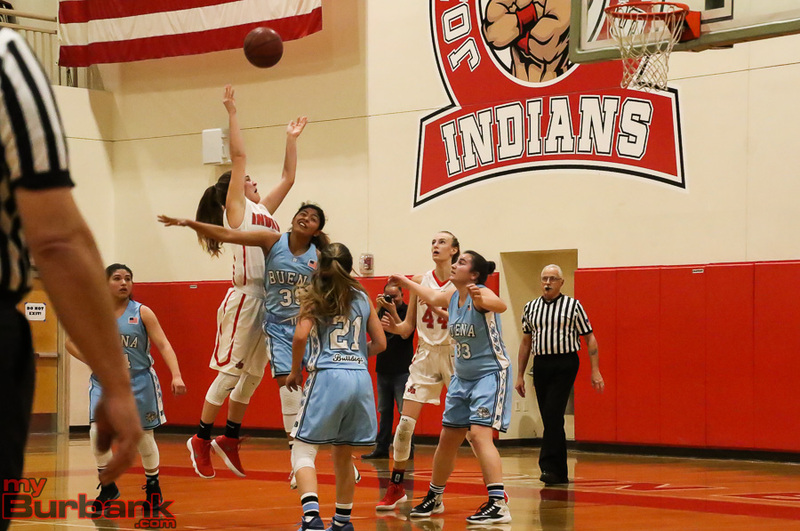 The Indians (19-7 and 9-3 in league) avenged a 54-52 overtime loss to the Falcons (19-6 and 10-2 in league) on Jan. 12 and remain in the hunt for the league title. 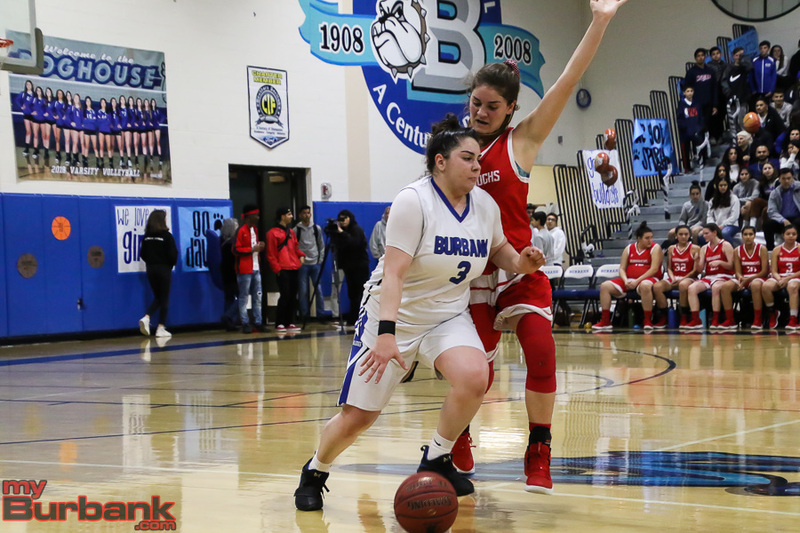 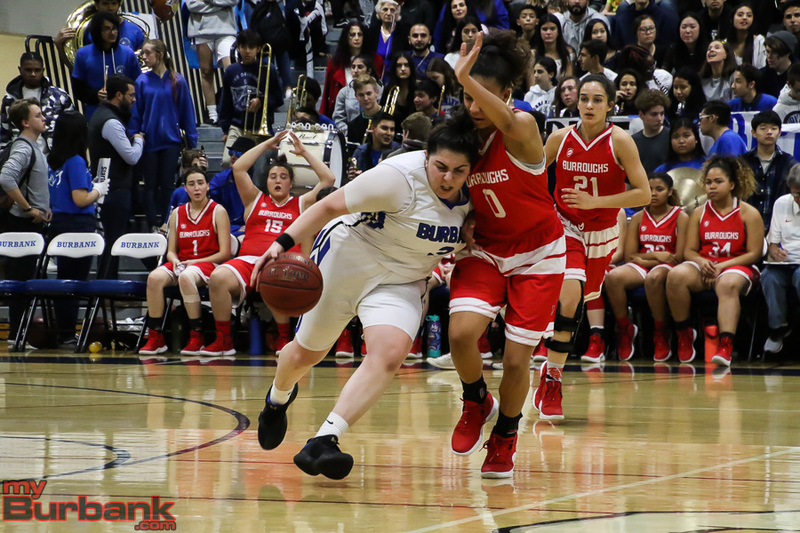 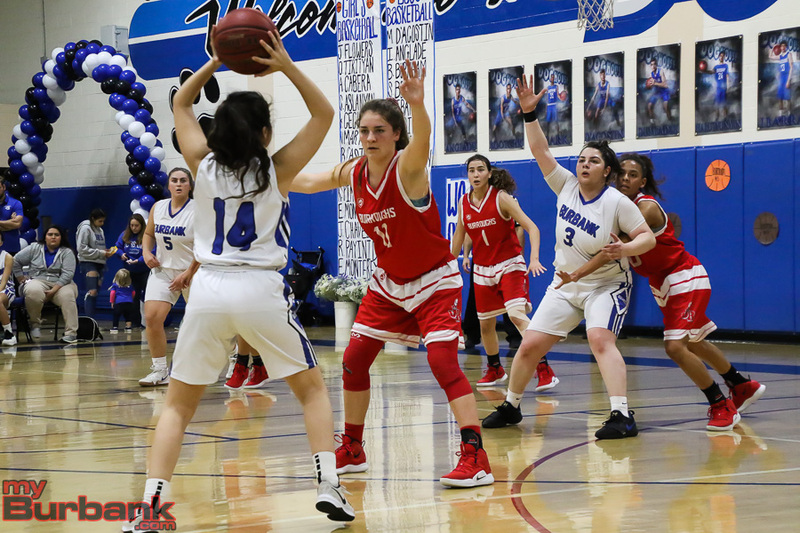 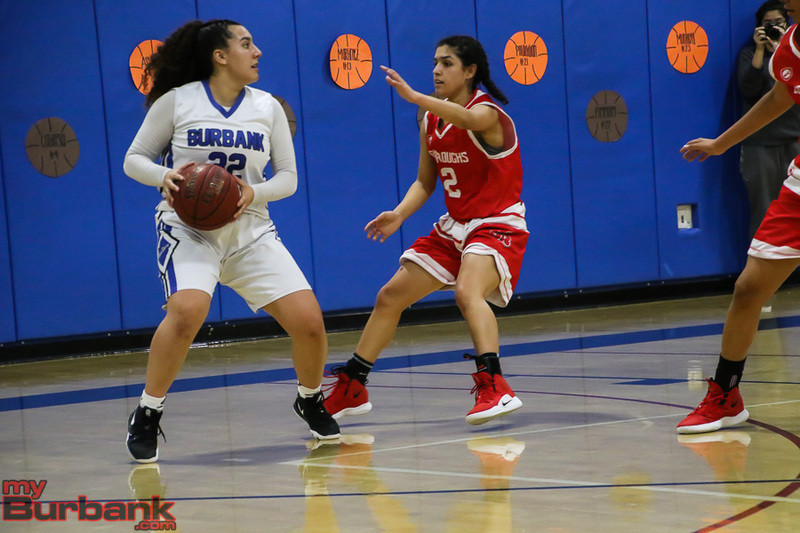 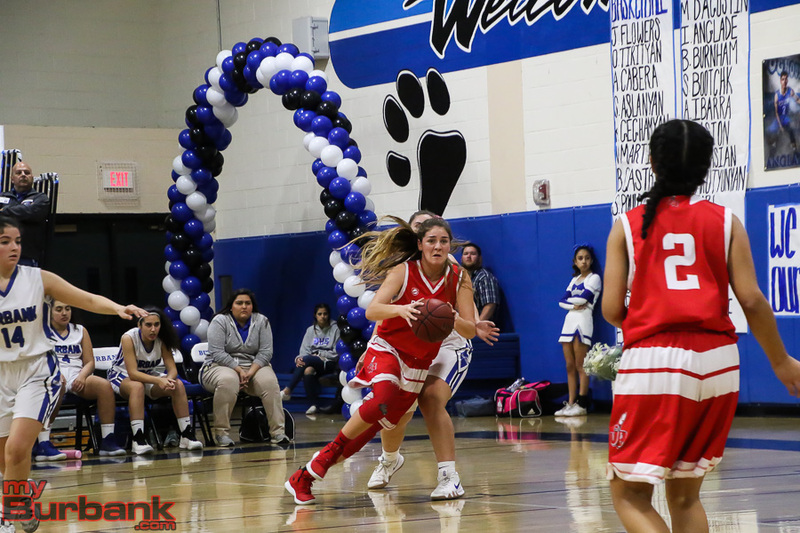 Burroughs has a home game against Pasadena on Tuesday and will host rival Burbank on Thursday in the regular-season finale. 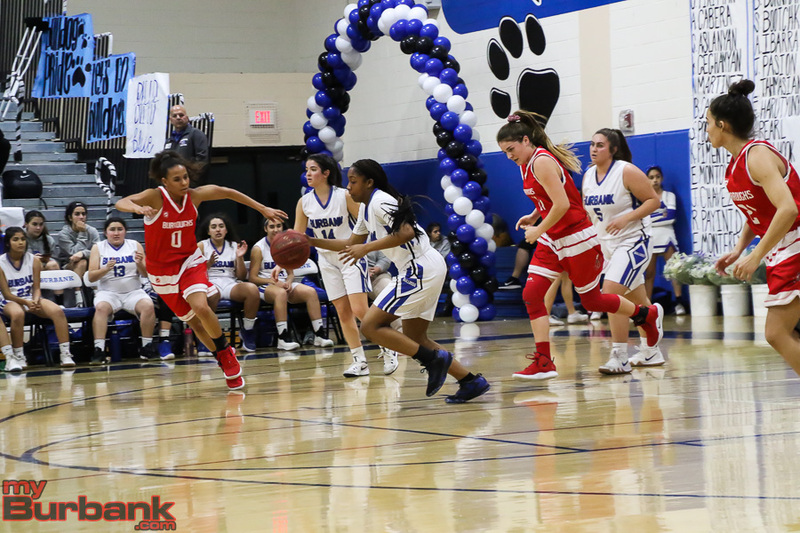 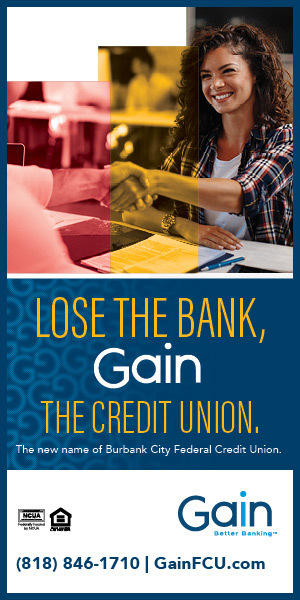 What was the key to Friday’s victory? 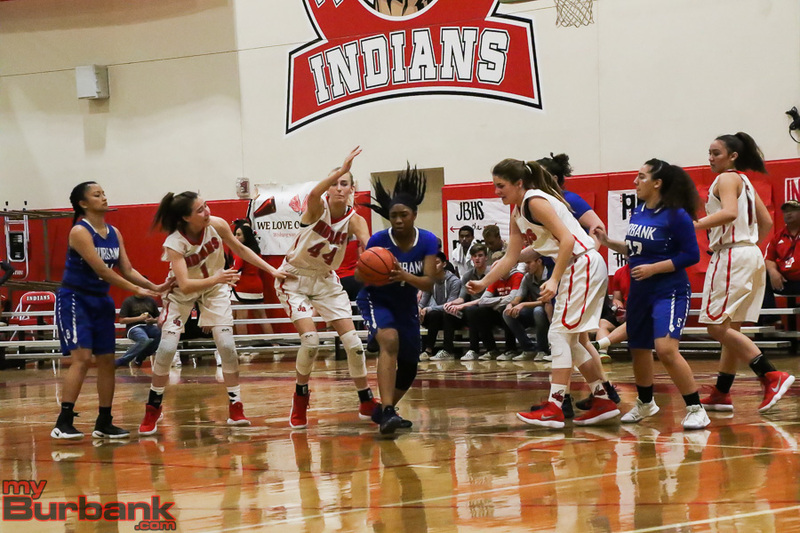 The Indians trailed 24-17 at halftime, but trimmed the lead to 35-29 heading into the fourth quarter when they outscored the Falcons 21-1 after canning nine of 13 shots from the field. 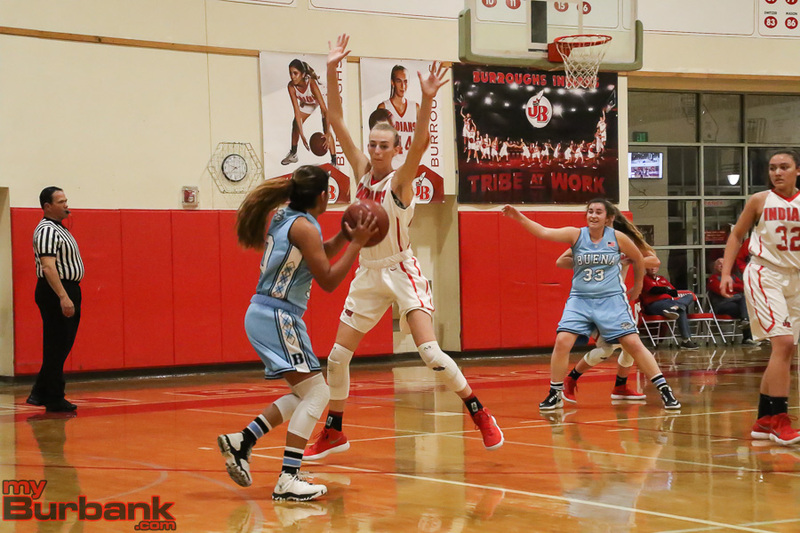 In fact, so overwhelming was Burroughs that it outscored Crescenta Valley 33-12 during the second half. 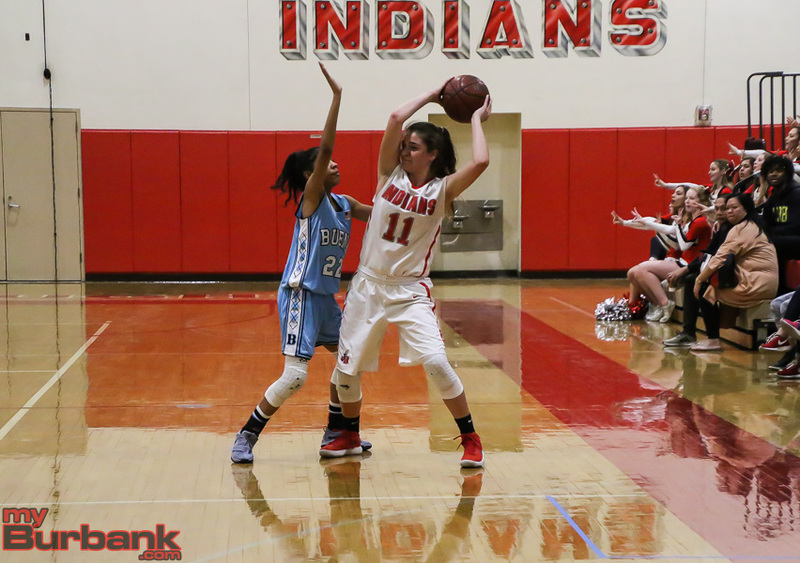 A bucket by junior swingman Jillian Kukawski (12 points) saw the Indians grab a 36-35 edge with 5:05 left. 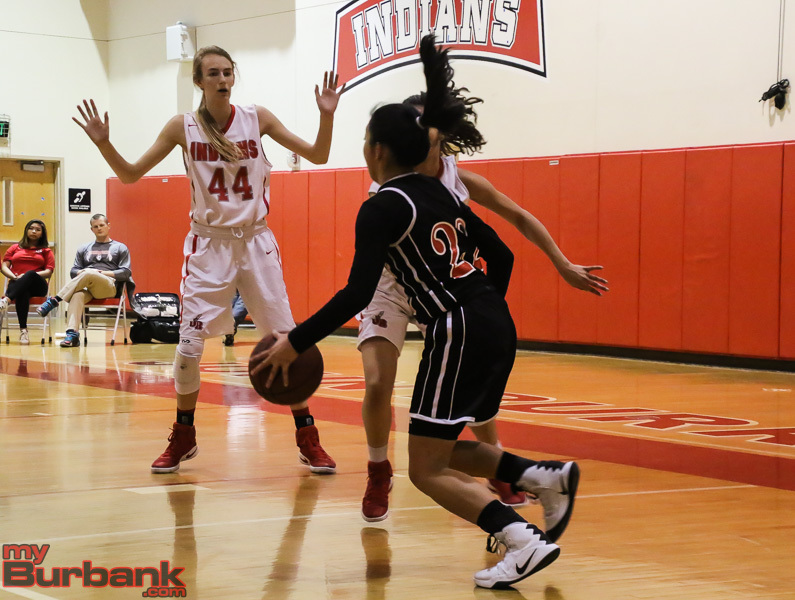 With 4:20 left on the clock, Burroughs then moved in front 38-35 on a hoop from Wrobel. 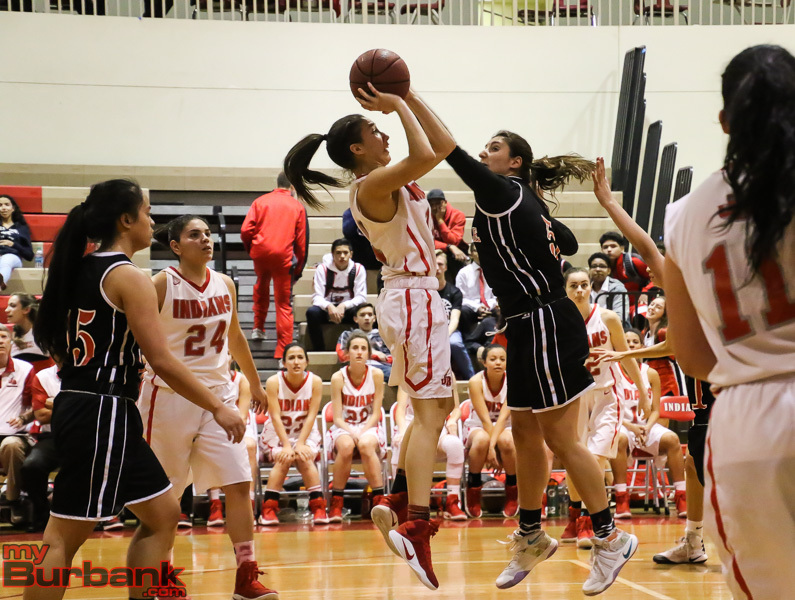 When Wrobel scored with 3:29 left, the Indians took control 40-35 as the Falcons called time out. 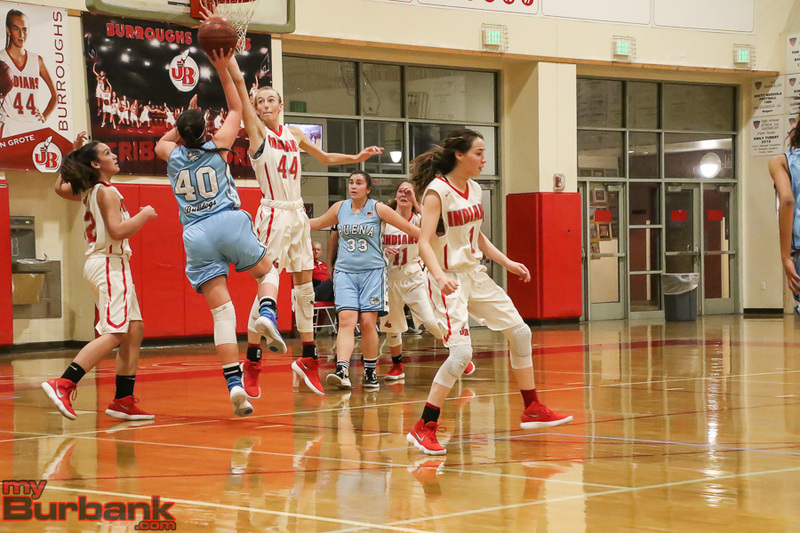 In the fourth frame, Crescenta Valley missed all 14 shots from the field with the only point a free throw from senior shooting guard Sarah Perez (nine points). 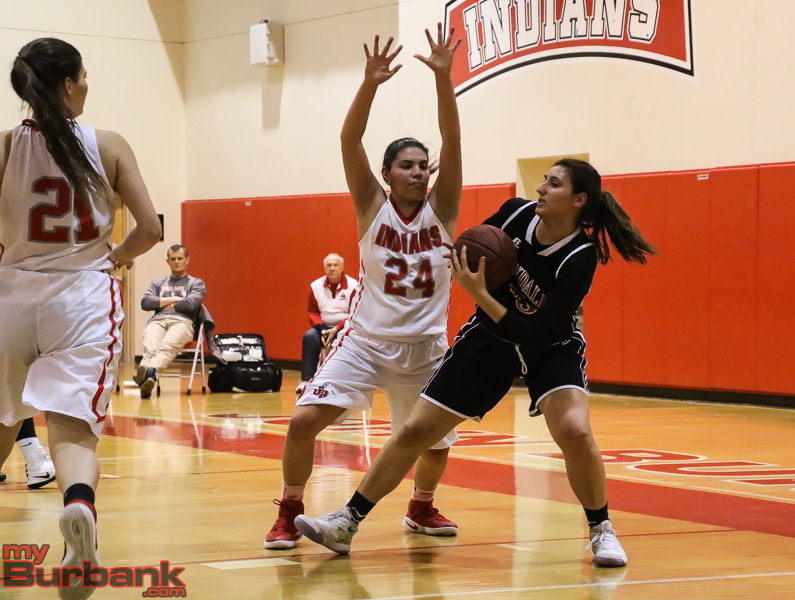 The Falcons converted 27.9 of their shots (12 of 43) from the floor, while the Indians hit 19 of 41 for 46.3 percent. 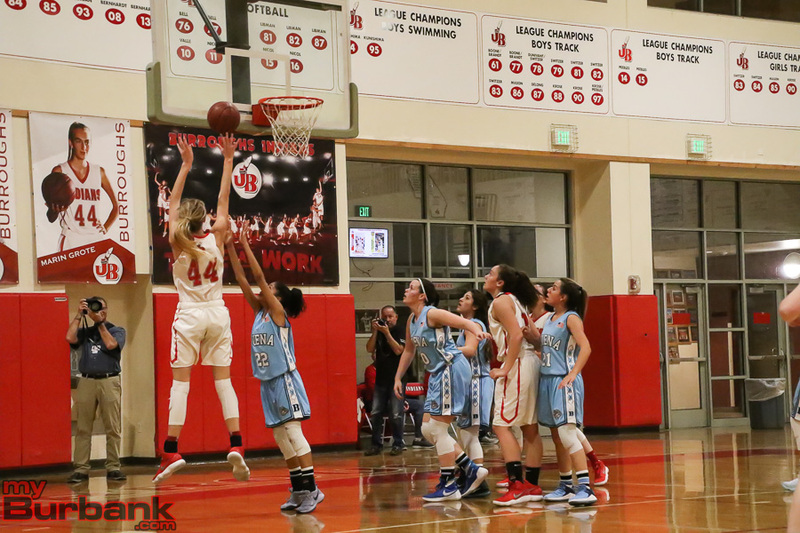 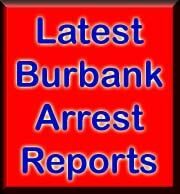 Burroughs dominated the backboards, outrebounding Crescenta Valley 45-17, including 23-8 in the second half. 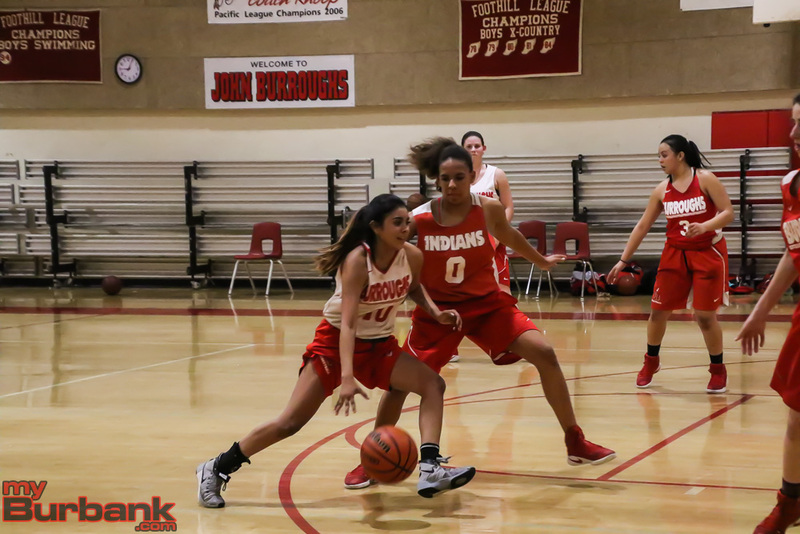 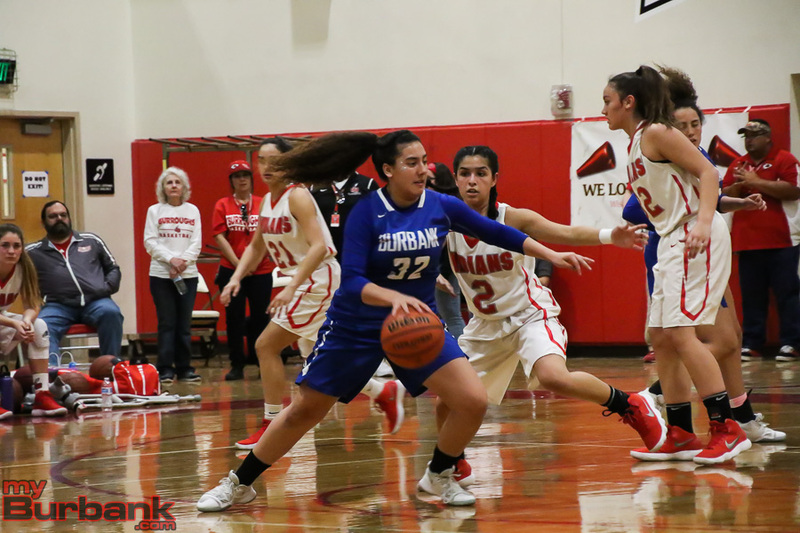 The Indians fell behind 12-7 after the initial frame as senior shooting guard Rachel Dayag (team-high 12 points) and Perez each scored five points. 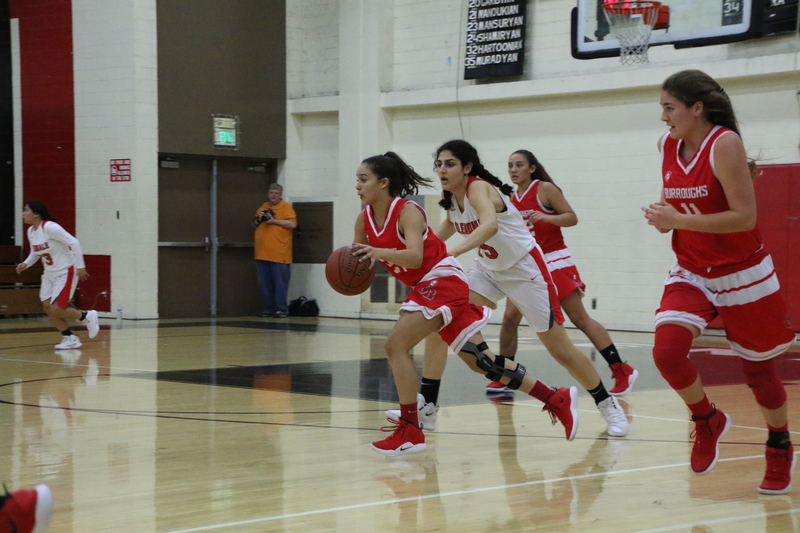 Del Castillo scored five points in the first period, while Boulanger hit two free throws and finished 10 of 10 from the charity line. 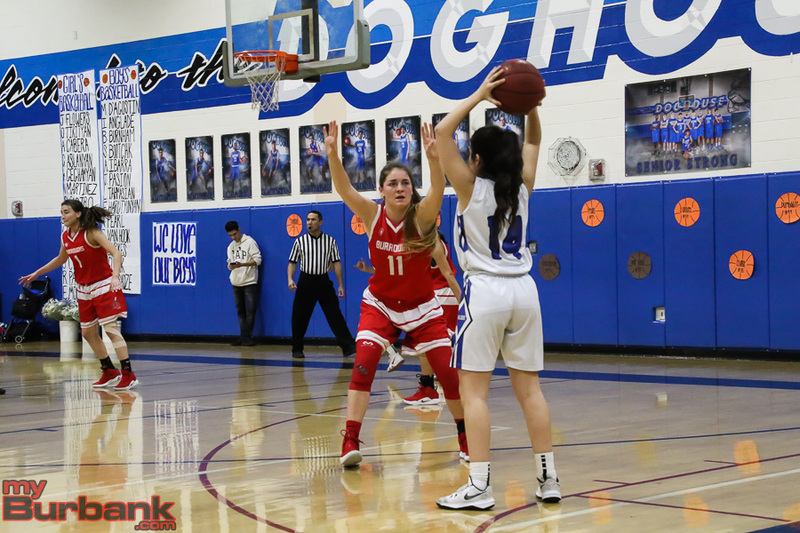 In the second quarter, Dayag dropped in a trey, added a free throw and then delivered the third from three-point range in the third quarter. 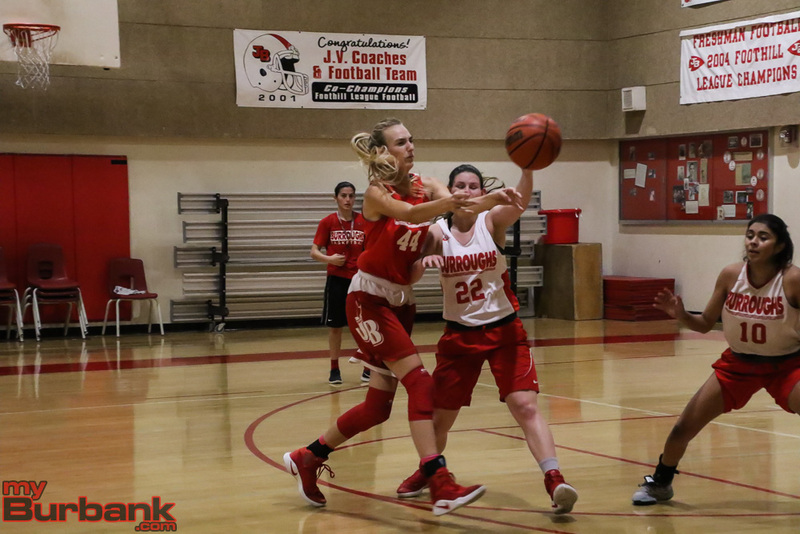 Burroughs senior center Marin Grote (12 rebounds) scored all of her six points in the second quarter, while Boulanger contributed four points. 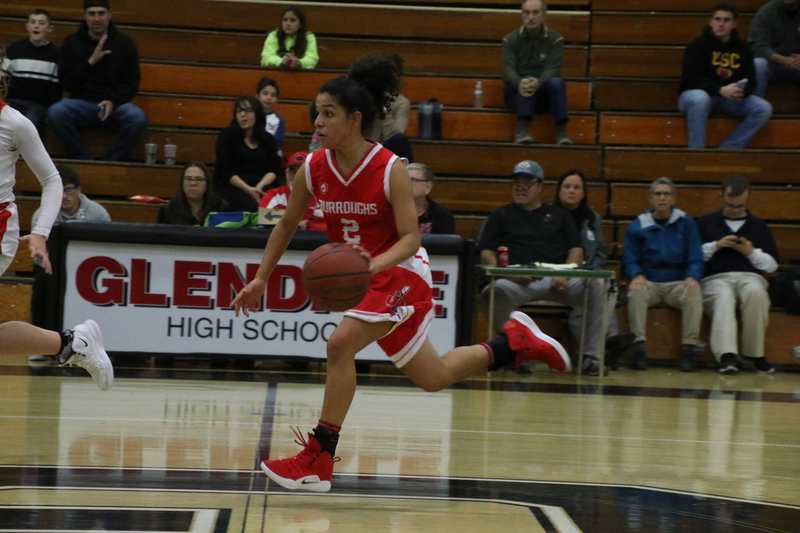 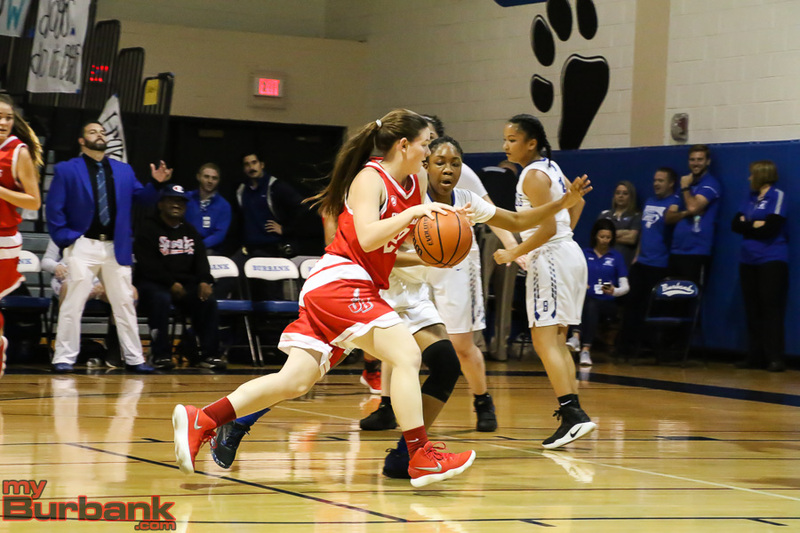 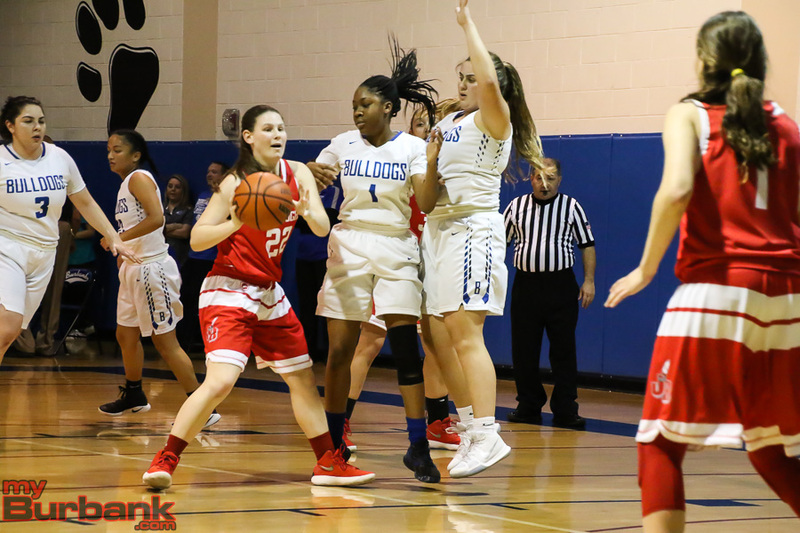 Boulanger tallied eight points in the third quarter including six points coming at the free-throw stripe and junior point guard Ariana Farias added two points. 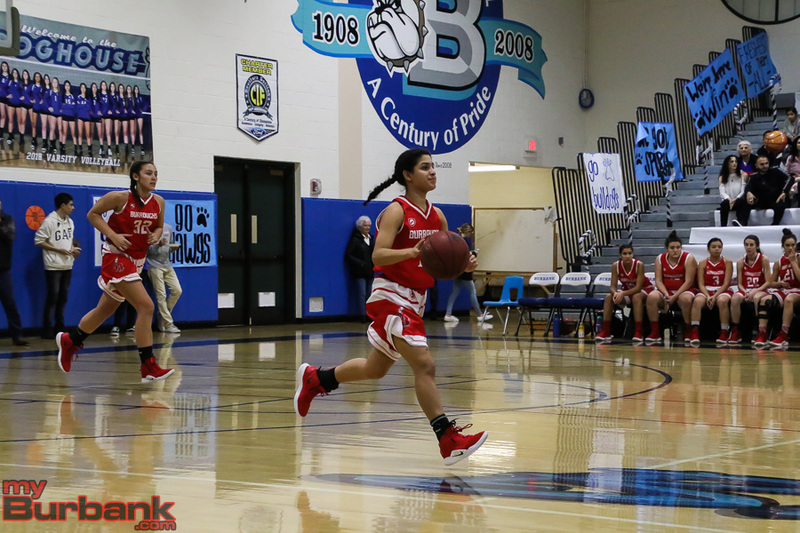 Boulanger again scored eight points in the fourth period, while Wrobel dropped in seven points and Kukawski had six. 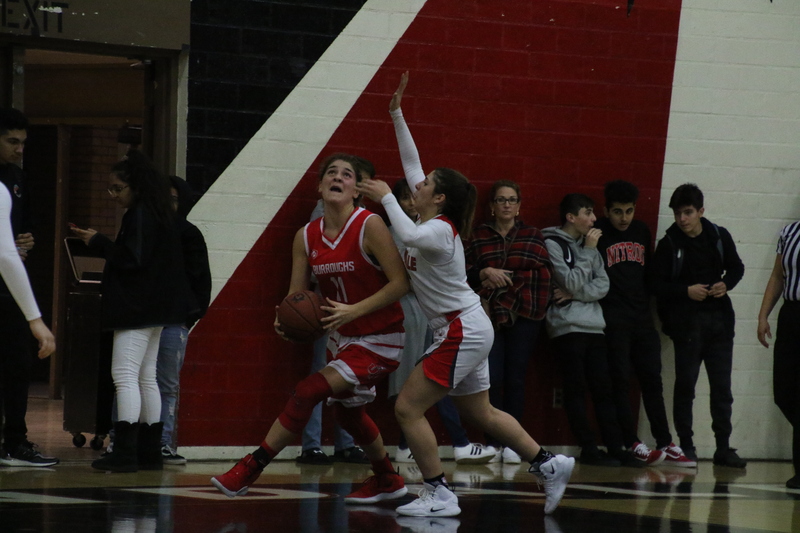 Despite the Falcons shooting decently in the opening half (42.8 percent on nine of 21), they struggled mightily in the second half, making three of 23 for 13 percent. 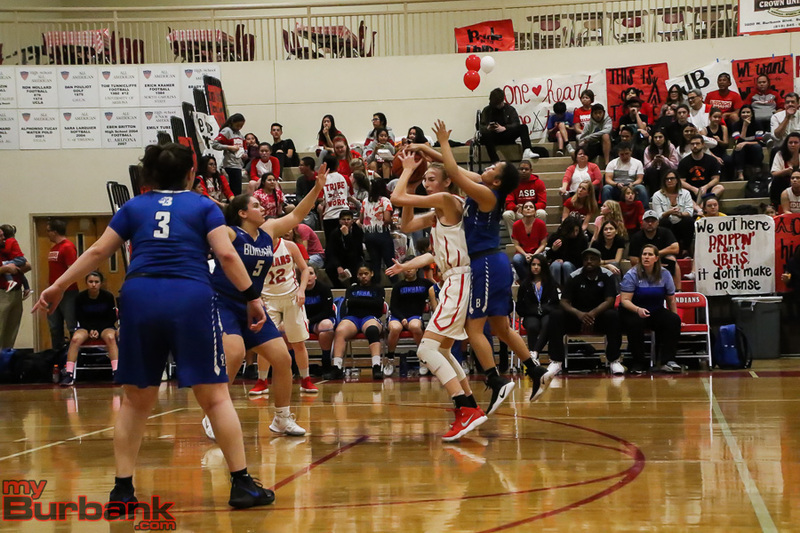 During that same stretch, the Indians converted 12 of 21 for 57.1 percent, made nine of 11 from the free-throw line and finished 11 of 19, while the Falcons drilled five of 10 free throws. 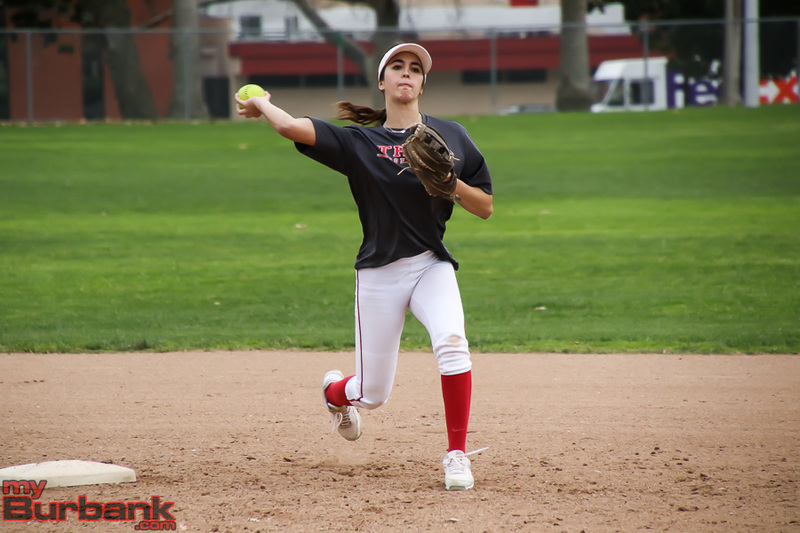 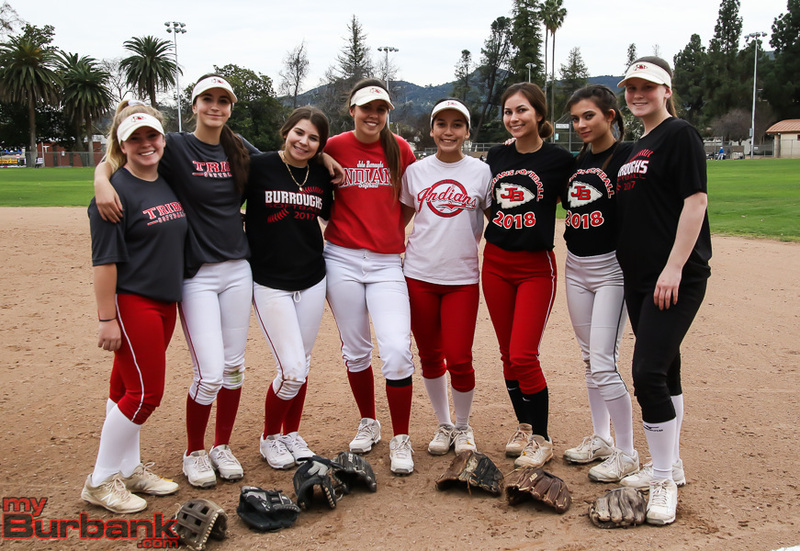 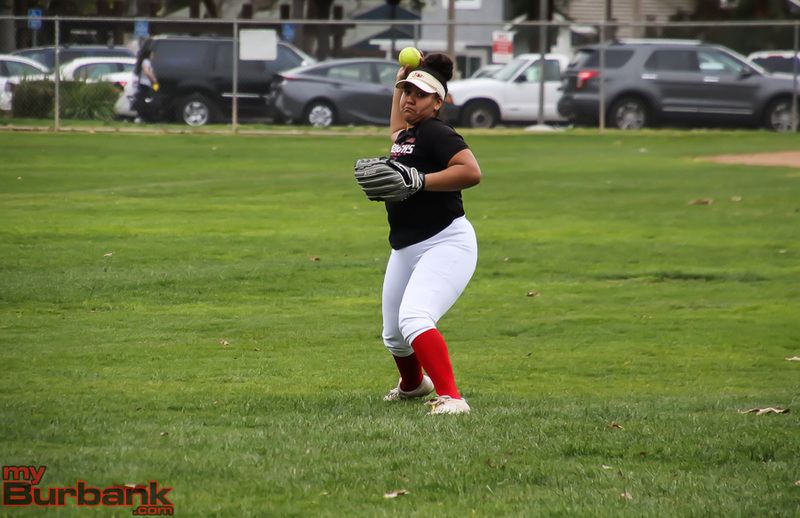 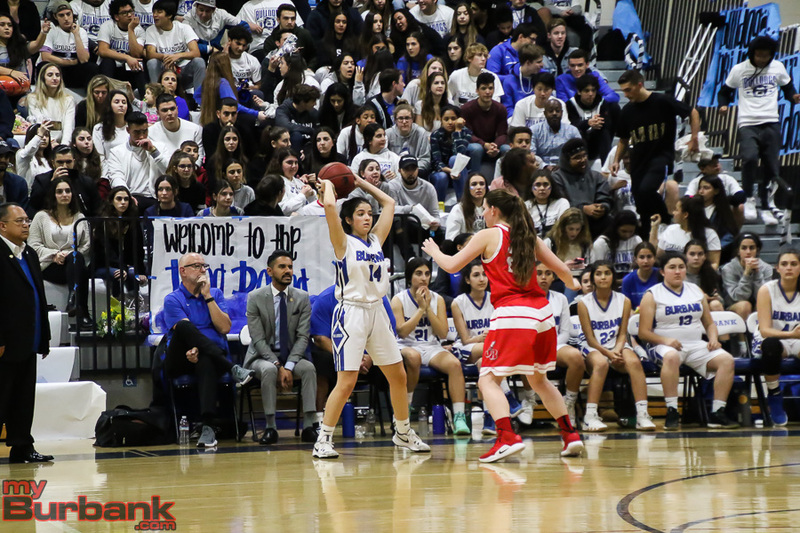 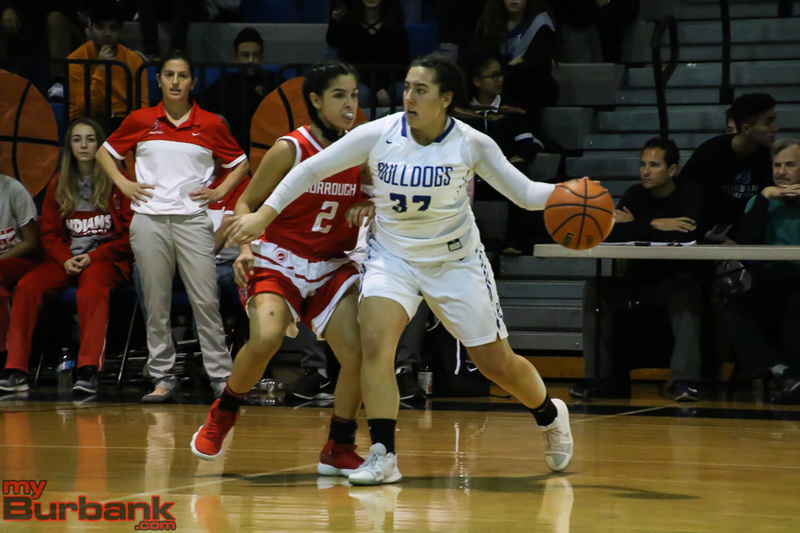 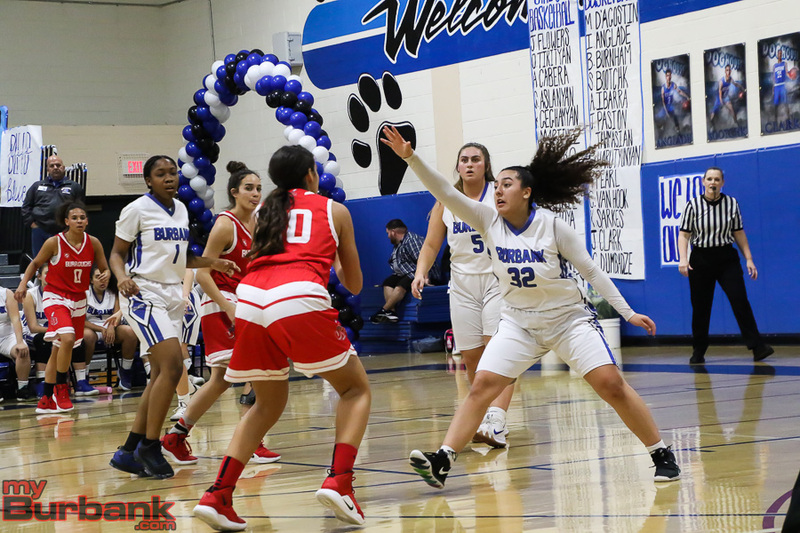 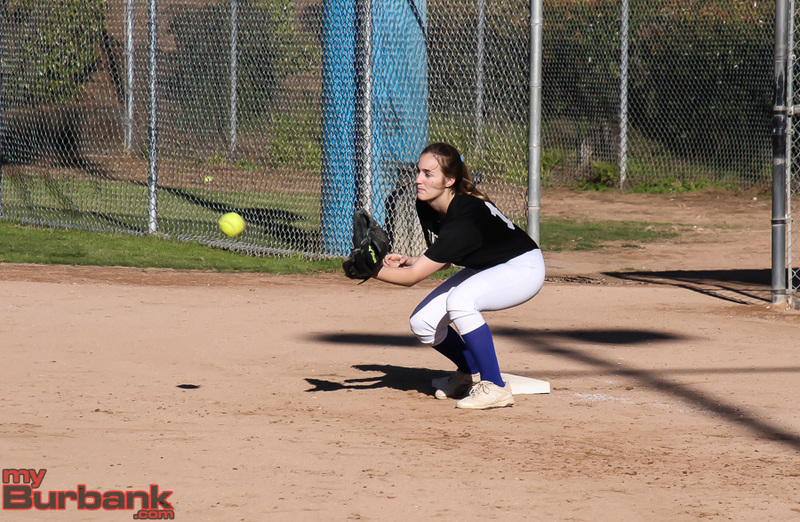 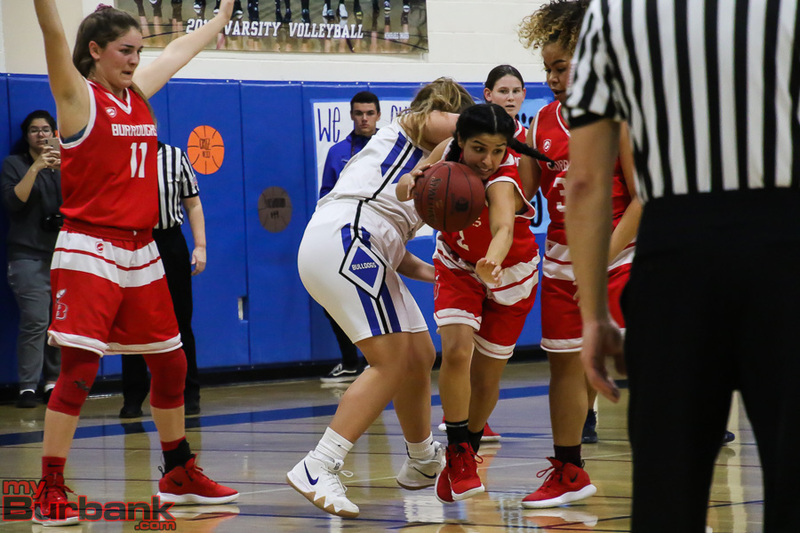 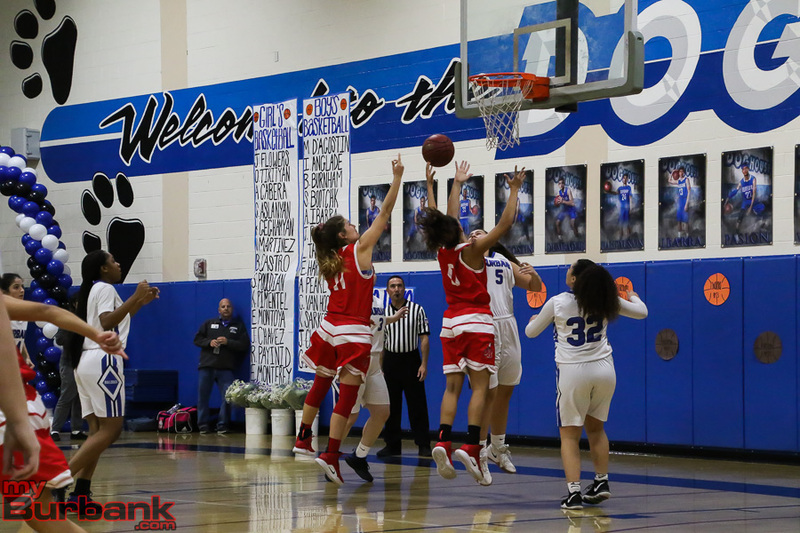 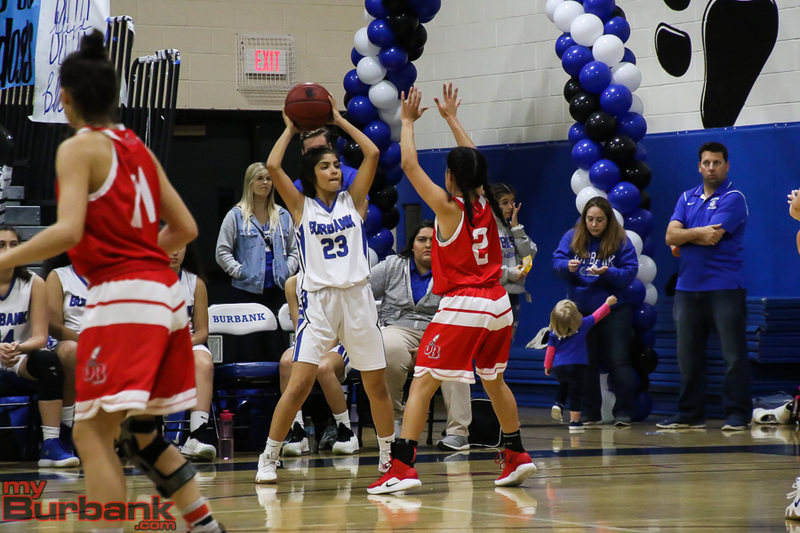 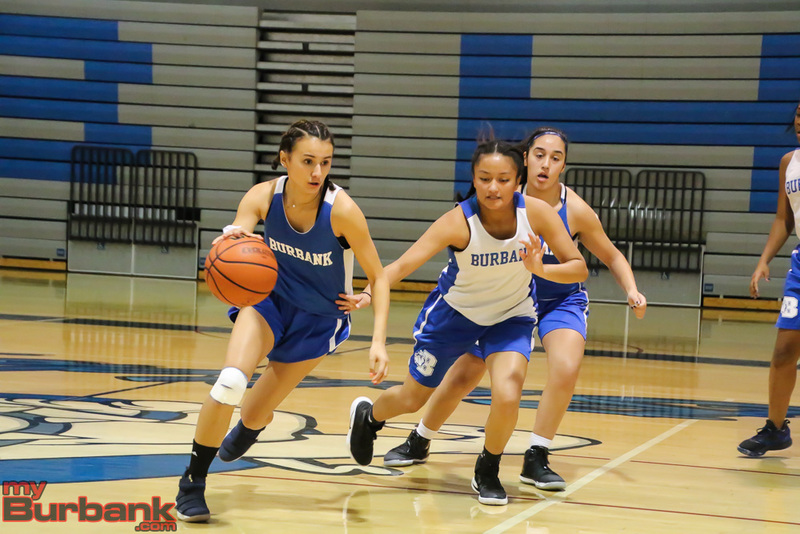 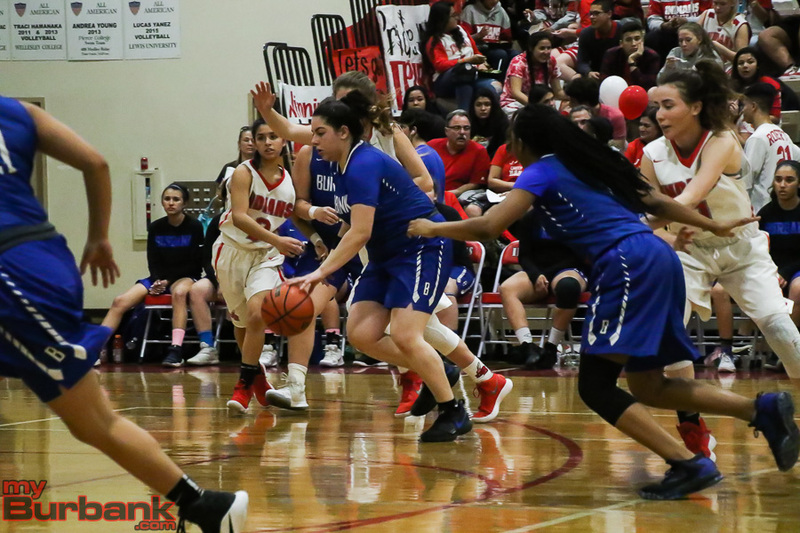 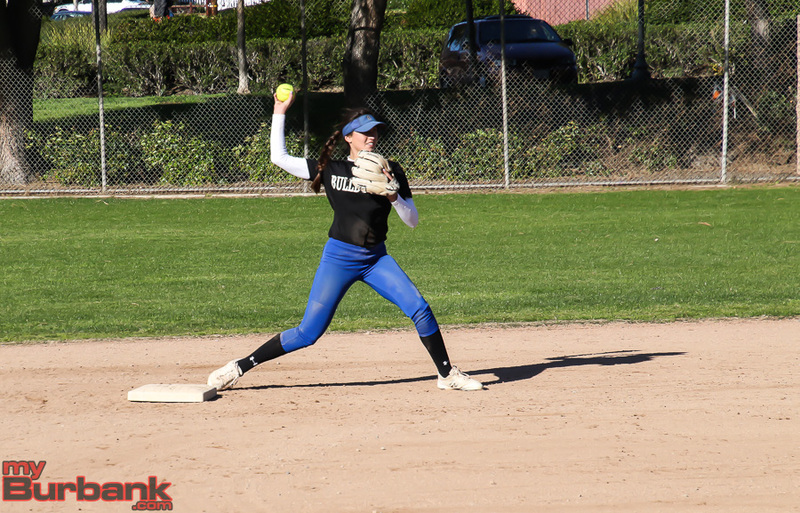 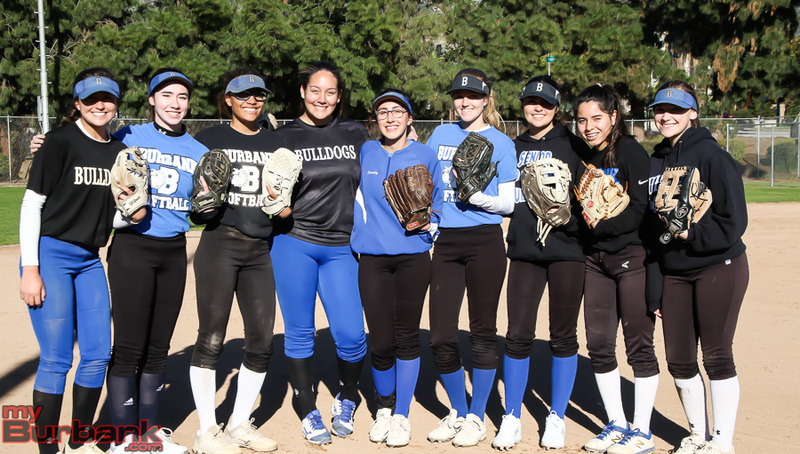 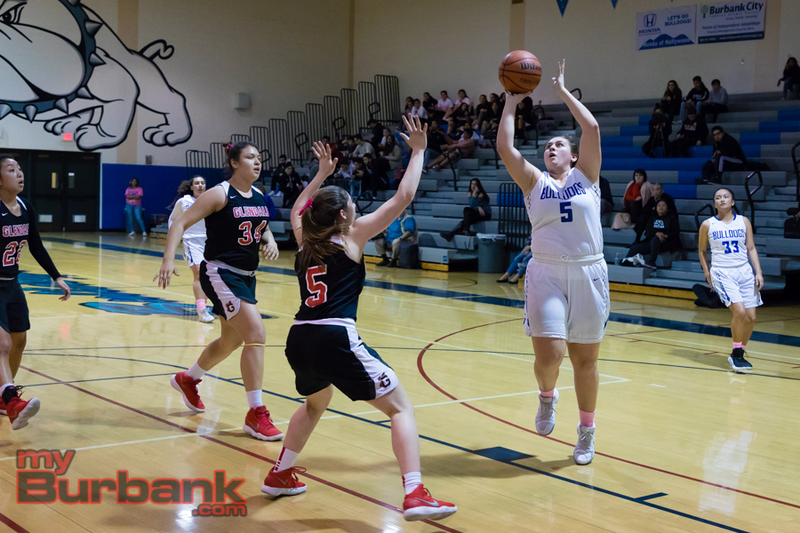 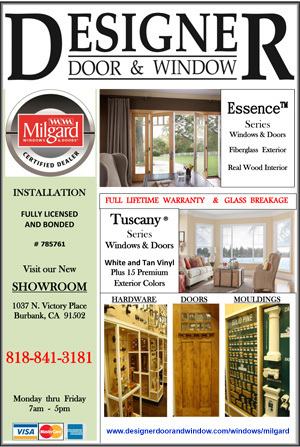 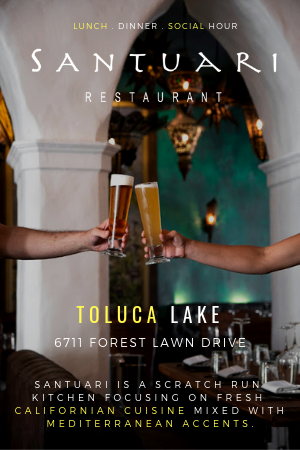 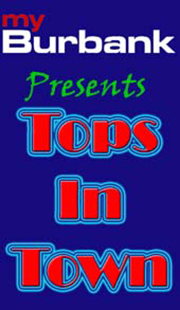 This entry was posted in Girls Basketball, Sports and tagged Ariana Farias, Burroughs High, Dyani Del Castillo, Faith Boulanger, girls basketball, Jillian Kukawski, Kayla Wrobel, Marin Grote, Pacific League on February 3, 2018 by Rick Assad.